You buy a box of wheat grass and some Gerber daisies, but the stems of the daisies in regular drinking straws, and poke them into the soil! A lot easier than it looks and it is beautiful. And I love Gerber Daisies! that is awesome!!! I think I might try it with some white shasta daisies! you could do it with white tulips :-) thanks for posting this! cute! where do you buy wheat grass?? I LOVE Real Simple... I can never bear to throw my old issues away! I am in love. Totally. I love it! Now I need to get my husband home to make the "trough" for me! Absolutely DIVINE! That's so easy, I think even I can do it. Oh, and isn't REal SImple THE best? They have awesome ideas! i am so excited to be able to do this. Thanks for all your AWESOME ideas! That is awesome! Where do you buy wheat grass? I want to make this with red gerbers. You can buy it an most health food stores. Also try farmers markets and juice shops. Cute! 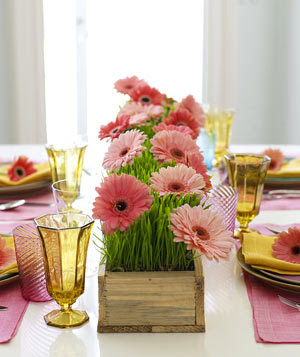 I have an old beverage crate on my table that the grass and flowers would look so cute in. I LOVE Gerber Daisies too. That is really cute and easy--something that I could do for sure!! Now I can see myself actually finishing this project. I have been looking for something with fresh flowers...beautiful! Gerber daisies are my fav.!! i love this!